A Qubit is the basic unit of information in a quantum computer. 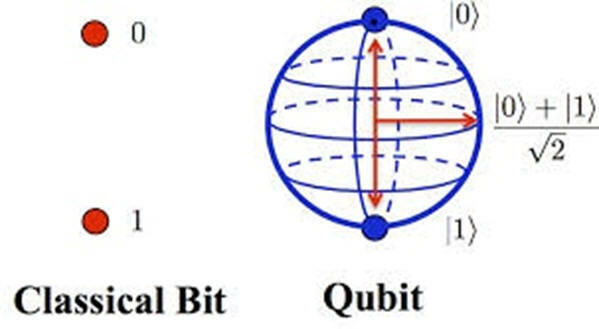 While a bit can represent just one of two possibilities such as 0 or 1, or yes or not, a Qubit can represent more: 0 or 1, 1 and 0, the probability of any occurrence when combined with more Qubits, and all that simultaneously. What is its scientific explanation ? So, a particle momentum looks different to different observers and the particle has several states simultaneously. For one observer, the probability of the particle momentum could be state for that observer. That is why one subatomic particle can have different states -and probabilities, at the same time. We can use it to replace bits and get better performance: Much better performance! But, what's the buzz about Qubits? When you combine Qubits, that combination holds an exponentially larger amount of information than bits. Subatomic logic is much more powerful than binary logic. You can process complicated information faster. Its main applications are encryption, decryption, modeling, databases, voice recognition, structure recognition and artificial intelligence, plus others yet non-existent applications. Simple computation like word processing, would not improve its performance with Quantum Computing. Image processing and artificial intelligence for diagnosing certainly will. Are those Quantum Computers already available? IBM developed the first quantum computer in the year 2000. It is a 5-atom computer and they expect to have a 10-atom quantum computer working in the year 2002, hopefully, commercial. What all this have to do with Medicine? All the possibilities of subatomic telematics (Telecommunication + informatics based on subatomic logic) will improve health care, surpassing unthought limits. Consider structure recognition, not limitted to imaging, and artificial intelligence, plus a further possibility of immediate communication with entangled subatomic particles. In simple words, it could mean automatic remote and reliable diagnosis, just to mention one possibility. If you want to learn more Quantum Computing, Subatomic logic, please use the preset web search engine at the bottom of this page. Once you verify this is logical -maybe subatomically logical ;-), but still logical, you will understand my project's goal. Why aren't you working on this right now? Unfortunately, I am not good at selling my ideas. For instance, ultrasound tissue image enhancement is a feasible possibility since 1992. But I have not enough resources to develop it by myself. However, I made work my Ultrasound color post-processing technique, since early 1994. But it is still limited to my patients. There are many more examples. We have been loosing valuable time in the mean time.
" ... There has been a long way from Newton to quantum computers. And there will be a long way from quantum computers to whatever it comes. The uncertainty principle changed the way we look around us. Particles have no defined positions and velocities, just a combination of both. Quantum mechanics tell us about possibilities. The "same" observation can produce different results. The observation itself changes the experiment results. We can even imagine parallel realities. What is true today, could be not true tomorrow .. ."
By that date, April 25, 1999, Quantum computers did not exist and light velocity could not be beaten. At least, there is one Quantum Computer now (May 07, 2001), and yes, light velocity was recently beaten, too. You need not think much to foresee the possibilities of Quantum Computing on preventive medicine.